Greenpeace propaganda | Mothers Against Wind Turbines Inc.
Wind power promises it is clean and green using the wind to generate electricity by spinning the blades of wind turbines. Focusing on the manufacturing process “clean and green” claims are tainted with growing issues surrounding the use of known pollutants used to make turbines. Turbine blade production involves plastics and composite materials to create the finished product. Like any industrial production the chemicals used can involve toxic water pollutants. Pollutants which if released into the environment (and includes exposure risk to health for the people on the shop floor) that can be persistent. Risks and remedies are being studied by looking at known and unknown adverse effects. Drinking water contamination concerns are heightened surrounding the types of plastics being used in the construction of industrial wind turbines. Additionally it raises questions about risks of harm to the environment once the blades are exposed to the natural elements after installation. The following is an example of PFOA containing products advertised for use in wind turbine blade manufacturing. A Welland wind turbine blade plant received approval to discharge emissions into the environment from Ontario in 2014. The list of allowed discharges reads like a chemical alphabet soup and clearly states that contaminates are surrounded by unknowns and no ministry standards. 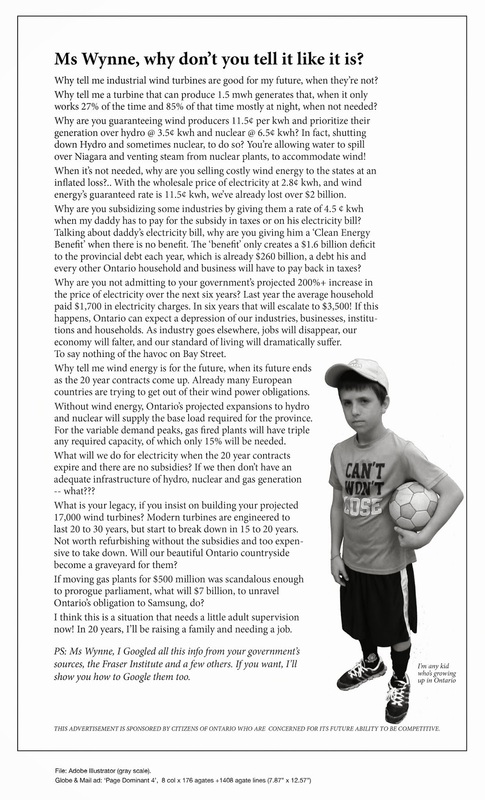 Ironically this particular plant was closed shortly after citing a lack of new wind projects in Ontario. READ about the plant closure. At the end of the day the blade production plant located in Welland, Ontario was closed after less than 2 years of production. Fossil fuel and insurance company executives “could face personal liability for funding climate denialism and opposing policies to fight climate change,” Greenpeace recently warned several corporations. In a letter co-signed by WWF International and the Center for International Environmental Law, the Rainbow Warriors ($155 million in 2013 global income) suggested that legal action might be possible. Meanwhile, the WWF ($927 million in 2013 global income) filed a formal complaint against Peabody Energy for “misleading readers” in advertisements that say coal-based electricity can improve lives in developing countries. The ads are not “decent, honest and veracious,” as required by Belgian law, the World Wildlife ethicists sniffed. Other non-governmental organizations (NGOs) make similar demands. These are novel tactics. But the entire exercise might be little more than a clever attempt to distract people from developments that could create problems for thus far unaccountable Big Green organizations. I don’t mean Greenpeace International’s $5.2 million loss a couple weeks ago, when a rogue employee (since fired) used company cash to conduct unauthorized trades on global currency markets. Other recent events portend far rougher legal and political waters ahead for radical eco-imperialists, especially if countries and companies take a few more pages out of the Big Green playbook. India’s Intelligence Bureau recently identified Greenpeace as “a threat to national economic security,” noting that these and other groups have been “spawning” and funding internal protest movements and campaigns that have delayed or blocked numerous mines, electricity projects and other infrastructure programs vitally needed to create jobs and lift people out of poverty and disease. The anti-development NGOs are costing India’s economy 2-3% in lost GDP every year, the Bureau estimates. The Indian government has now banned direct foreign funding of local campaign groups by foreign NGOs like Greenpeace, the WWF and US-based Center for Media and Democracy. India and other nations could do much more. Simply holding these über-wealthy nonprofit environmentalist corporations to the same ethical standards they demand of for-profit corporations could be a fascinating start. Greenpeace, WWF and other Big Green campaigners constantly demand environmental and climate justice for poor families. They insist that for-profit corporations be socially responsible, honest, transparent, accountable, and liable for damages and injustices that the NGOs allege the companies have committed, by supposedly altering Earth’s climate and weather, for example. Meanwhile, more than 300 million Indians (equal to the US population) still have no access to electricity, or only sporadic access. 700 million Africans likewise have no or only occasional access. Worldwide, almost 2.5 billion people (nearly a third of our Earth’s population) still lack electricity or must rely on little solar panels on their huts, a single wind turbine in their village or terribly unreliable networks, to charge a cell phone and power a few light bulbs or a tiny refrigerator. read more: Climate Change Dispatch, Written by Paul Driessen, guest post on July 07, 2014.